This is a continuation of the series of article "Getting Ready For Karmic Koala". The previous articles in this series are: 1, 2, 3, 4. You might have heard it or maybe you have not, but Karmic Koala is to have GRUB 2 by default if you did a clean install. However, if you upgrade from Jaunty, you will retain GRUB, which was used in Jaunty. So this article is to help those upgrading from Jaunty get GRUB 2 in their system. Warning: This is for Karmic. In Jaunty, you will encounter errors if you follow the following steps. 3. A "configuring grub-pc" will come up. Select "Ok". 4. After selecting "Ok" in step 3, you will see a question, "Chainload from menu.lst?". Select "Yes". This allows the user to test GRUB 2. 5. Now there will be be an option to import sections from GRUB's menu.lst to the "Linux Command Line". Just select "Ok". 7. 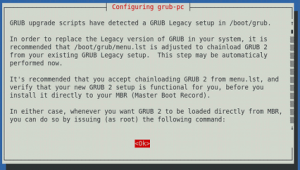 In GRUB you will see an entry "Chainload into GRUB 2". Select it to see if GRUB 2 is working properly. GRUB 2 will then show you where it's booting from. Done. You now have GRUB 2 installed.